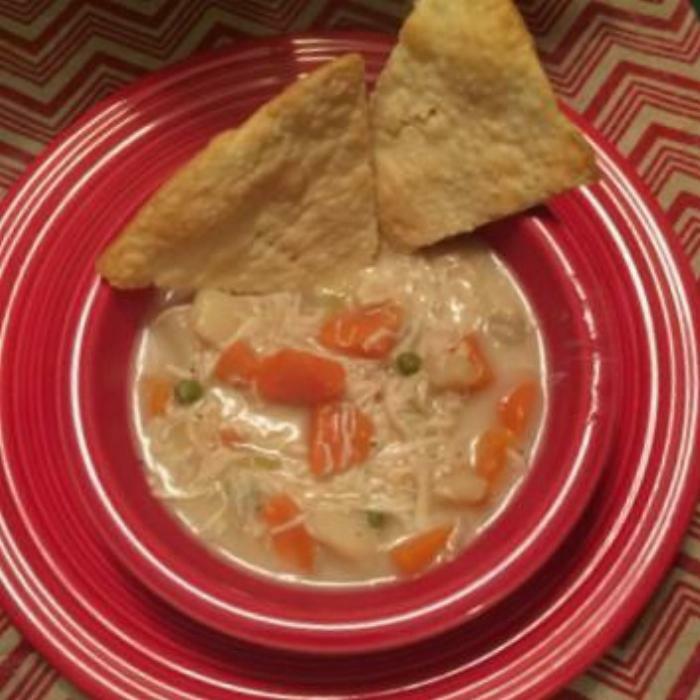 Chicken Pot Pie with Crust Crackers is the perfect comfort food! The "Crust Crackers" add an extra treat and so easy to make! 2Place chicken tenders in the Instant Pot with one cup of the broth. Season with salt and pepper. Set the IP to "manual" setting for 15 minutes. Do a quick pressure release by turning the valve from "sealing" to "venting." Place on cutting board and shred. Pour the broth left in the pot into a bowl. Set aside. 4Set IP to "saute" setting. Add butter to the IP and melt. Then add flour and whisk until it bubbles. Then slowly add chicken broth, whisking vigorously. Cancel "saute." Start it again but this time adjust it to "more" and bring to a rolling boil. Boil it for 5 minutes to thicken. When thickened, cancel "saute." Start it again on "normal" and add cooked chicken, Veg-all, garlic, salt, and pepper. Let the soup simmer for about 5-10 minutes. Add the milk/cream and stir. Set the IP to warm. 7for 10-12 minutes. Cut into triangles with pizza cutter. Serve with soup.